As we get hire higher up on the ladder, there is a need to be more thorough; that’s a fact. But when candidates at entry-level positions are coming in for their 5th interview, you’re just wasting time—theirs and yours. Ask yourself why these additional interviews are necessary. 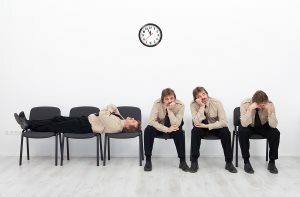 All too often companies use the interview process to delay hiring. Don’t string candidates along. You should know who and what you’re looking for before this process started. If the reason behind all of these interviews is for different members of the team to take a crack at them, you might want to try group interviews. If group interviews are a bit inquisition-y for you, maybe using video interviewing would be best. Video interviews can be shared and commented on by all members of the hiring team. Take a tip from Google and get rid of the stupid questions. Believe it or not, these “out of the box” questions intended to gauge creative thinking, although terribly misguided, are still common practice for some hiring teams. The right answer to, “How many golf balls can fit in a school bus?” will not get you the right candidate. It will get you candidates who can Google. Recruiters are often not fully in charge of their hiring process. Their clients make some tests and screening practices mandatory. Giving feedback to the client and getting him/her engaged in the process early on will help snag the right candidate without the person having to name the states in alphabetical order. Whether you’re delaying the decision or you’re untimely with your correspondence, get a move on! The importance of time-to-fill seems to be frequently ignored. The cost of a bad hire isn’t this shield we hide behind while we take our sweet time getting through a lengthy hiring process. The organization needs this position filled; otherwise you wouldn’t be filling it. The candidate needs a job; otherwise he/she wouldn’t be applying. Get on with it already. Personal references aren’t even worth the time it takes to dial the number. Personal references are almost always not chosen wisely. They either cannot speak to the candidate’s work ethic or performance, or they are not able to give a truly objective point of view. Stick to requiring work or education references. Who are you going to get more relevant information from, their neighbor or their old boss? This is a no-brainer. If you’re going to make the calls and ask the questions, make it worth your time. Coming from a spreadsheet junky, know the limits of your tools. We’re in the day of big data, and candidate profiles are larger and more frequently changing than ever. Are you keeping up? Assess what is lacking about your candidate management system and figure out what you need to keep things running smoothly. You should also consider these tools on the candidate’s end. Ensure that your online application system is simple and user-friendly. And your career site should be easy to navigate and updates frequently. The candidates whom you are after aren’t interested in wasting time and they know their worth; they can go elsewhere. Streamlining your hiring process can go a long way to ensure that each candidate has a better experience and you are more productive. Assessing your current hiring process is that starting point to better recruiting.